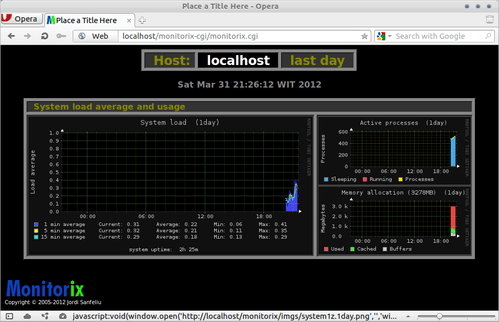 Monitorix is an free and open source system monitoring tool that allows users to monitor via web browser. Monitorix also monitoring services including CPU temp and load, Active processes, Allocated memory, Hard disk temp, Kernel usage, Network activity,Graphic Card temp and usage, and More. 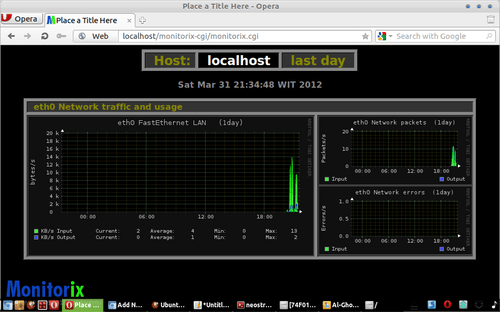 Monitorix designed for used under production Linux servers, but you can use it on your laptop or on your Linux box at home as well. Monitorix developed is based on the Red Hat Linux and Fedora Core distributions, so this project has been made keeping in mind these distributions. Monitorix 2.5.0 has been release by Monitorix Developer,it available for major linux distributions ( Redhat, Fedora ,Centos, FreeBSd, Arch Linux, Gentoo, Debian Based Distribution,OpenSuse). Added a complete statistical Lighttpd graph. Added full support for the Postfix MTA in the Mail statistics graph. Extended the number of information in the Mail statistics graph. Added support to monitor unlimited number of local or remote Apache servers. Added support to monitor unlimited number of local or remote MySQL servers. Added support for Dovecot 2.0 log format. Optimized a lot of code including more regular expressions. Replaced hardcoded graph titles with the strings in the configuration file. Improved the init script to be more LSB-compliant. Fixed some titles in the list box of the main page. Fixed color overriding in the IMAP and POP3 services graph. Fixed the title in some graphs. Fixed a typo in the debug array name that prevented individual debug working properly. Fixed a bug in the Squid graph that prevented of being counted the Aborted clients. Fixed numbering in some graphs.